In the Metro station, the underground, you know when a train is not coming. Even without the rush hour crowd, the air is still, a bit humid, even somehow hot in the middle of October. It is just under the Lehel market, where a few meters above a woman has been frying Lángos for hours, a butcher cutting the cheeks from pigs. Men, no matter the age, are gathering around the café stands for espresso, perhaps a shot of Pálinka for the construction workers who have just finished a worker’s breakfast of eggs and cheese, bread and sausage, noodles, cabbage. Some of the political banter streams down to the trains where everyone now is waiting. The clock on the wall counts down between trains. Never more than four minutes. 3:30. 3:00. Just enough to listen to a good song on your ipod. Your Metro mix. Just enough time for the ticket agents to sweep through and check your public transportation pass, hoping to find an uncertain tourist who doesn’t speak the language, who didn’t punch the ticket correctly, from whom they will steal six thousand forints. But hey, you’ve been here long enough to know not to look them in the eye, to have your papers ready. You’ve been here long enough to have an hour’s worth of songs on your ipod. Tom Waits for early and crowded Tuesdays. Townes Van Zandt for the rest of the morning ride. When the train comes, it’s not the train that announces itself. It’s the breeze, first, and then the sweeping, steady air that blows even the shortest of stubborn, brown Hungarian hairs from their styled dos. The train arrives with the wind first. And then you can see the lights cresting through the tunnel. It’s not a lovely train. It’s an old, blue, Eastern European train with ties to a Soviet past, with ties to an above ground factory somewhere now rusting in a vacant town. It’s the beauty of it really. The simple pace of the life here. Doors open. A bell rings. Doors close. A little blue paint chips from the door, kicks up to the market street, up through the steam vents and staircases, past flower vendors and bakers. Someone is going somewhere. It’s amazing how you can describe things. It makes me feel like go and travel by the metro ASAP to re-enjoy it through your eyes. 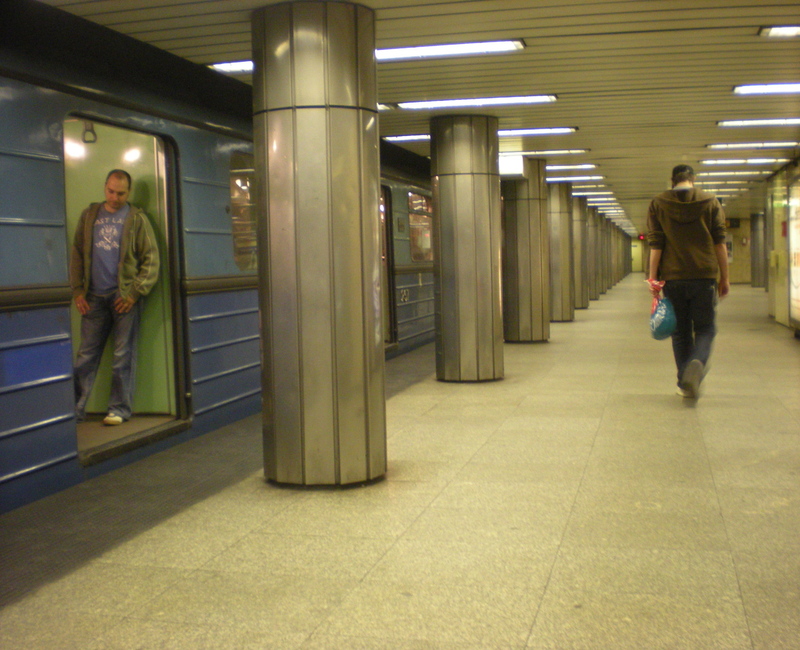 Thank you for giving me another meaning of the blue line subway of Budapest. But seriously. What I’m really curious about is the occupation of the gentleman with the pole and bucket who boarded. Does he wrangle wild animals on the streets of Budapest, or does he change light bulbs in vaulted ceilings?